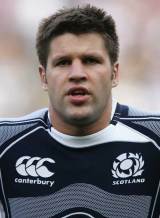 Edinburgh flanker Allister Hogg has become one of the most important members of the Scotland squad since his debut against Wales in 2004. Hogg's pace, power and work-ethic have endeared him to Scottish fans and also led to him becoming one of the most reliable players in a setup that has all too often teetered on the edge in recent years. Hogg immediately cemented a spot in the Scotland setup following his debut, a fact highlighted by his 47 caps gained in five years. Hogg was selected for Scotland's 2007 Rugby World Cup squad, becoming the only Scottish forward to record a hat-trick of tries as he chipped in 15 of Scotland's 42 points against Romania at Murrayfield. Hogg continued to have an influence as Scotland improved throughout 2008, playing in both Tests as they registered a series draw in Argentina before packing down against the All Blacks and South Africa at Murrayfield during the autumn internationals. In January 2009 Hogg was called into Scotland coach Frank Hadden's squad for the 2009 Six Nations.